You gave something of a historical review of Civil Service reform and outlined the more recent attempts by your own committee before concluding that, “reform is not something you can do to an organisation from the outside.” If this is the case then reform relies upon dysfunctional bodies having the insight to identify and modify their own weaknesses. In the case of PHSO their five-year change programme under the leadership of Dame Julie Mellor has been a spectacular failure. 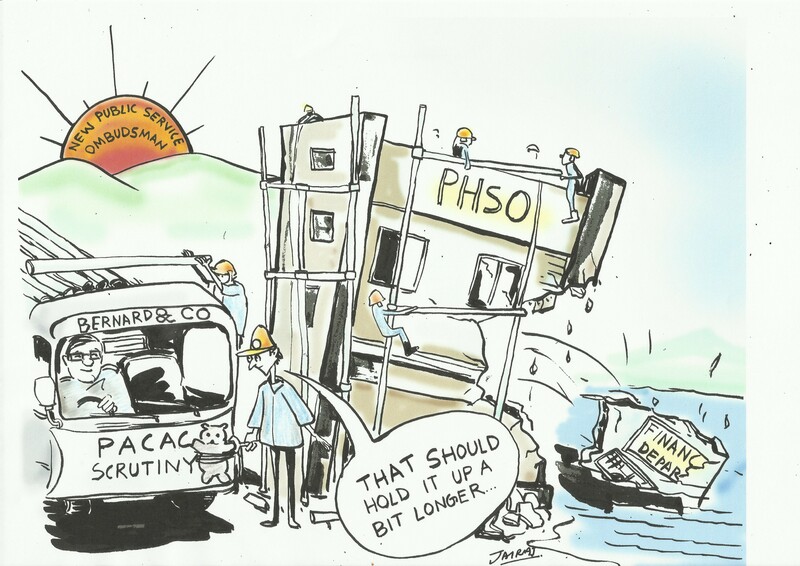 phso-can-a-dysfunctional-organisation-reform-itself/ As you aptly pointed out, reform depends on effective leadership but you also stated that leadership is the last to admit the failings of the organisation. Without external involvement, the organisation will writhe through years of sorry decline as those who can leave (24% staff turnover at PHSO) and those who remain are unable to find an outlet to voice their concerns. PACAC, your committee, are the only parliamentary body who can oversee the Ombudsman, but with your hands-off approach, this organisation has been allowed to limp from one failure to another delivering scandalously poor investigation reports to the public. At the heart of the problem and the elephant in the room, is the fact that protection of Civil Servants and Crown Servants offers protection to the Ministers, to government and to everyone else who might be held to account for poor decision making and basically corrupt behaviour. Parliamentarians choose the leaders of these organisations who are all clones of previous leaders. So we have an endless loop where only the names change, but the process stays the same. Has civil service reform failed due to the lack of genuine impetus to reform this body from those with the power to do so? We have had reform of the benefits system, which was imposed from the outside and behaviour was modified through punitive sanctions. Equally, government have achieved reform of the NHS through the imposure of new legislation and new work contracts. These two events did not take years of delicate negotiation to modify internal cultures and just goes to show what can be achieved in a relatively short time when those in power can see the benefits of the reform. External public accountability, if consistently applied, can alter behaviour. Substantial compensation payouts would sharpen the focus of organisations controlling tight budgets while public reports of upheld complaints would make it clear to all parties what went wrong and why. Yet years of light-touch, self-regulation backed up by regulatory bodies who are devoid of effective enforcement powers have allowed public servants to act with impunity. As you say, we may have moved from the ‘age of deference’ to the ‘age of reference’ however, parliamentary and public bodies use every trick in the book to keep the truth under wraps and deny justice to the public. Reform of the Civil Service, reform of the Ombudsman and reform of parliament itself will continue to revolve like the ‘cracked record’ you mentioned because the present system suits those who are on the inside and they care not for those who are on the outside. If reform requires internal change then you need to appoint change makers; people who think outside the box, do not bow to the establishment and have the courage to take risks. You have the opportunity afforded to you by the early resignation of Dame Julie Mellor, the Ombudsman to make such an appointment for the PHSO. Will you take this opportunity to deliver a change leader, to ensure there is improved accountability across public services or will you select another safe pair of hands? Actions speak louder than words Mr. Jenkin. Previous Previous post: How do you solve a problem like Dame Mellor? Home office that allows CHILDREN of say mid 30’s from camps in France under the cloud of refugee support in to the country is a Joke! The best one – Borough Councils that assess applicants for Council Tax Support and assess them without reference to legislation that regulates them: even though the regulations are on a .GOV.UK website and three separate Solicitors advise them they are wrong. Oh and it takes an MP to force them to look again at an application before recognising they didn’t know anything about the legislation before they were challenged – and these are assessors! The truth is, there is nothing that can be done about it until the Public revolt and string these people up by the necks! You are right Steven, they can behaviour appallingly knowing they will let each other off the hook. Accountability works when members of the public are fined for driving offences and other misdemeanours, but for some reason holding public servants to account is never considered to be an option. Creates a culture of fear, they say, so instead we have a culture of impunity. Bernard Jenkin lost all credibility for PACAC – by writing a supportive letter to Dame Julie Mellor on her resignation. This is the Ombudsman who received a damning court criticism of the actions of her deputy Mick Martin – and sat on the information for eight months – until the Health Service Journal outed her. Bernard Jenkin’s letter, which it must be remembered is on behalf PACAC, shows that our elected representatives were willing to not only turn a blind eye to Sir Alex Allen’s report conclusions – but condone her behaviour leading to her resignation. Clearly it was not just an unimporatant ‘filing error’. The question is -How on earth could Dame Julie Mellor- a former head of equalities no less- seemingly ignore and therefire condone this appalling act of discrimination against a female for eight months – until outed by the HSJ? And why is Bernard Jenkin citing her ‘personal integrity’ after doing so? The Ombudsman is given the power of a high court judge because its assumed that the office holder has an equivalent amount of integrity. What Dame Julie Mellor did was to ignore a Tribunal findings, showing contempt for the judicial institution by not acting immediately. How could she explain the eight month hiatus, the off-the-record meeting with Mick Martin …and still, according to Bernard Jenkin, emerge with a ‘conscientious and rigorous standards’? The ‘off the record’ with Mick Martin meeting is certain evidence that no full proof of her ‘ conscientious’ and ‘rigorous’ actions could ever be evaluated. Either she did not consider the matter seriously, or she wanted no evidence of her actions on record. And if PACAC can’t act with rigour and integrity over this matter, what gives this committee the right to express any opinion on determining the future of the PHSO? Dame Julie Mellor also failed to inform the board of Ms. Marks damning letter regarding the Deputy Ombudsman. That smacks of a cover-up to protect a cover-up. No integrity whatsoever. Mr. Jenkin and PACAC nailed their flag to the PHSO pole when they failed to inform the public of a scrutiny meeting where Dame Julie would be present; clearly to protect her from having to face concerned members of the public. It’s a cosy club. Thanks Della. Its a wonderful letter and now posted widely! Thanks again! I’m getting tired of politician hot-air. They can take swift enough action when they want to, all these inquiries and consultations are just a smoke screen. Not mincing words here. They are quite simply liars and cheats. Yes we, the general public, get penalised for parking in the wrong place, but they (the great and mighty Hospital Trusts and PHSO who work in collusion), act in an immoral and illegal way and never fear being held to account. Their investigations warp the person they write about, they miss out the obvious facts and focus on the smaller issues or indeed they ‘make up’ the smaller issues and embellish them so that the real problem gets pushed aside. They have wrecked not only my husband’s life but mine as well. I have fought for five years now and no one has listened. When you realise that Dame Mellor, (Ombudsman), informed the Queen of her resignation it makes one wonder just how deep this breath-taking corruption goes. I wouldn’t ever advocate fighting for this countries liberty if our government felt it necessary , however I would fight for social justice for each and every human being on this planet. Thanks Della, as ever your letter is on point.